The liturgical life of the parish is vibrant and alive, with uplifting music and thought-provoking homilies. There are many opportunities for devotion in addition to Masses at Saint Pius X, with many of them listed below. Interested in liturgical ministry at the Sunday Masses? Please phone our parish office. Meets on Mondays at 7:30 pm in the Choir Room of the Church and is an active experience with singing and spontaneous prayer. The group has been in existence for over 45 years, but is always renewed by new participants. Contact: Parish Office. Meets on First Saturdays, time/place TBD. This group is for those with a strong devotion to Our Lady and is not only about prayer but also spiritual works throughout the weeks. This ministry has two components. The first is to assist families as they prepare for the funeral liturgy and to offer other family support as needed. The second is providing hospitality after the funeral liturgy by coordinating the preparation and serving of a meal and fellowship. The mission of Volare Women is to enrich the spiritual and sacramental lives of women in our parish through worship, study, discussion and fellowship. The current list of events is coming soon. Adoration of the Blessed Sacrament takes place on First Fridays from 12 Noon to 7 p.m., with Mass taking place at 5:15 p.m. For more info, please phone our Parish Office. 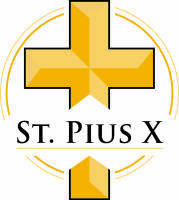 This group is primarily made up of Saint Pius X School parents but they also pray the rosary in the Chapel after the Tuesday School Masses during the school year. All are invited to participate in the Mass and the rosary.